The alluring contemporary Enzo dining collection will bring a sleek and refined look to your dining décor. Made out of hardwood solids and cherry veneers and bathed in a warm brown finish, the pieces in this collection will create a calming atmosphere in your home. 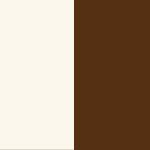 White painted drawers contrast the brown just perfectly, enhancing the contemporary look to new and stunning heights. 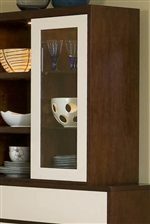 Highlights included the China cabinet's light switch, which will illuminate your most precious dishware at night, and the ball-bearing drawer glides that allow you to easily open and close the drawers. Luxurious and in style, the Enzo dining collection will add richness and depth to your dining room. 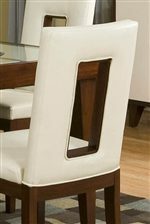 Browse other items in the Enzo Dining collection from Del Sol Furniture in the Phoenix, Glendale, Tempe, Scottsdale, Avondale, Peoria, Goodyear, Litchfield, Arizona area.